“Beautiful Day” begins with Dexter playing father-of-the-year as he flies a kite with his son Harrison and coaches the boy’s soccer team. The Pixar-like montage is meant to display the last six months of Dexter’s life where he continues to blend in to his surroundings, despite the fact that his sister now knows his true nature. Since Deb shot LaGuerta in that abandoned trailer, our antihero’s lifestyle seems to have improved. The Bay Harbor Butcher case has been put to rest once more and he is left a free man, even though he murdered hundreds of Miami natives. Perhaps the most obvious problem in Dexter’s near-perfect life is that his loving sister has abandoned him as well as the department she once resided over. Deb has switched departments and is working deep undercover. Socially, she is popping prescription pills from different doctors and living in hotel rooms with her suspect, Andrew Biggs (played by Rhys Coiro—Billy Walsh from Entourage). The two spend their evenings doing blow, rolling around in bed or setting up illegal deals, while she claims to be getting intel on the criminal. While viewers see a side of Deb that has appeared to hit rock bottom, it seems that her guilt has destroyed her while Dexter is business as usual. In truth, however, Dexter is slowly losing control of his life and his surroundings. An interesting dynamic this season will be how much Dexter truly needs Deb in his life. Dexter is more worried about his sister doing drugs than he is about the fact that she murdered an innocent person for him. His camouflage as a normal person is slowly starting to fall. Although he can mock human interaction, he truly has no real understanding of compassion for those recently deceased. Besides chasing clues about his missing sister, Dexter is also assigned to examine a new case involving a serial killer that slices out part of his victim’s brains—the portion associated with empathy. Dr. Evelyn Vogel (Charlotte Rampling), a retired neuro-psychiatrist, decides to come into the office to help with the case. Right away, she asks Dexter a series of questions that reveal her to have arterial motives. Right away, viewers are left to ponder if she is the brain-slicing killer or does she know about Dexter’s past? Either way, she appears to be trouble for our protagonist. Later in the episode, she asks for Dexter to meet her in the morgue, which is unusual given his job description alone. She asks him a series of questions about the Bay Harbor Butcher, pointing out contradictions in the killer being Doakes. Continuing to follow Deb, Dexter ends up killing her new suspect/boyfriend with a knife in somewhat of a self-defense situation (not uncommon for Deb’s men). More unsettling than the murder, Dexter left Harrison in the back of his car. After Deb decided to cover for Dexter once again, he returns to find an empty car seat. A quick search finds the boy walking around looking for his father. Dexter picks him up, with the blood of Deb’s boyfriend quite literally still on his hands. Feeling rejection from his sister, Dexter is left to ponder his circumstances on a bench dedicated to LaGuerta. While trying to arrange some alone time, Dr. Vogel shows up to add a little more weight to his shoulders. She hands him a packet of papers that are drawings from a disturbed child. Involving bloodshed, murder and an image of what could be a “Dark Passenger,” Dexter becomes hostile seeing his name in crayon at the bottom of the pictures. Dexter confronts her by pushing her up against a building in the park. Calm despite being threatened by someone she believes to be a killer, she tells Dexter that she doesn’t meet Harry’s code. 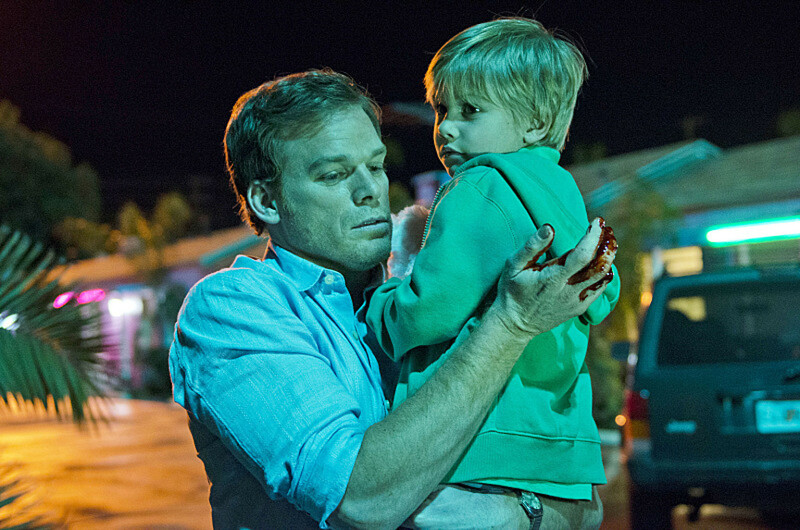 Dr. Vogul will be a crucial part of Dexter’s future and his past. Abandoned by his sister and walking on eggshells in terms of his own code, Dexter needs someone to remind him of his original morals if he hopes to make it out of this season alive.